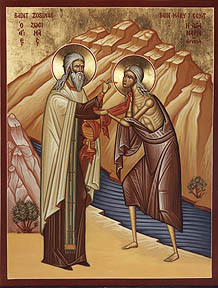 Our venerable mother Mary of Egypt was a desert ascetic who repented of a life of prostitution. She lived during the sixth century, and passed away in a remarkable manner in 522. The Church celebrates her feast day on the day of her repose, April 1; additionally, she is commemorated on the Sunday of St. Mary of Egypt, the fifth Sunday in Great Lent. She began her life as a young woman who followed the passions of the body, running away from her parents at age twelve for Alexandria. There she lived as a harlot for seventeen years, refusing money from the men that she copulated with, instead living by begging and spinning flax. One day, however, she met a group of young men heading toward the sea to sail to Jerusalem for the veneration of the Holy Cross. Mary went along for the ride, seducing the men as they traveled for the fun of it. But when the group reached Jerusalem and actually went towards the church, Mary was prohibited from entering by an unseen force. After three such attempts, she remained outside on the church patio, where she looked up and saw an icon of the Theotokos. She began to weep and prayed with all her might that the Theotokos might allow her to see the True Cross; afterwards, she promised, she would renounce her worldly desires and go wherever the Theotokos may lead her. After this heart-felt conversion at the doors of the church, she fled into the desert to live as an ascetic. She survived for years on only three loaves of bread and thereafter on scarce herbs of the land. For another seventeen years, Mary was tormented by "wild beasts—mad desires and passions." After these years of temptation, however, she overcame the passions and was led by the Theotokos in all things. Following 47 years in solitude, she met the priest St. Zosima in the desert, who pleaded with her to tell him of her life. She recounted her story with great humility while also demonstrating her gift of clairvoyance; she knew who Zosima was and his life story despite never having met him before. Finally, she asked Zosima to meet her again the following year at sunset on Holy Thursday by the banks of the Jordan. Zosima did exactly this, though he began to doubt his experience as the sun began to go that night. Then Mary appeared on the opposite side of the Jordan; crossing herself, she miraculously walked across the water and met Zosima. When he attempted to bow, she rebuked him, saying that as a priest he was far superior, and furthermore, he was holding the Holy Mysteries. Mary then received communion and walked back across the Jordan after giving Zosima instructions about his monastery and that he should return to where they first met exactly a year later. When he did so, he found Mary's body with a message written on the sand asking him for burial and revealing that she had died immediately after receiving the Holy Mysteries the year before (and thus had been miraculously transported to the spot where she now lay). So Zosima, amazed, began to dig, but soon tired; then a lion approached and began to help him, that is, after Zosima had recovered from his fear of the creature. Thus St. Mary of Egypt was buried. Zosima returned to the monastery, told all he had seen, and improved the faults of the monks and abbot there. He died at almost a hundred years old in the same monastery. Later, the story of Mary's life was written down by St. Sophronius, Patriarch of Jerusalem (cf. "External links"). The Life of St. Mary of Egypt is read during Great Lent along with the Great Canon of St. Andrew. For you took up the Cross and followed Christ. But to care instead for the soul, since it is immortal. Therefore your spirit, O holy Mother Mary, rejoices with the Angels. You became through repentance a Bride of Christ. Therefore, O most glorious Mary you are a Bride of the Kingdom! This page was last edited on February 19, 2013, at 14:34. This page has been accessed 3,470 times.